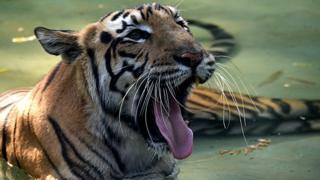 India's Supreme Court has dismissed an appeal to stop forest rangers from killing a "man eating" tigress in the western state of Maharashtra. The court said it would not interfere if forest rangers are forced to shoot the tiger if they fail to capture it. India's tiger population - which had been on the decline for several years - has steadily increased since 2006 when the country upped its conservation efforts. Forest official Pradip Rahurkar told BBC Marathi that officials would first try to tranquilise and capture the tigress, known as T1. "If this is unsuccessful, the animal will have to be shot in order to avoid further loss of human life," he added. Officials said they will also try to tranquilise the tigress's two cubs and a male tiger called T2, which has been spotted roaming the same territory. It has not been blamed for any deaths. But the two petitioners who took the case to court alleged that the forest department does not have the "requisite expertise" to capture the animal alive and will end up shooting it. "We are doing everything we can to save T1 and her family because they are innocent and vital to our ecosystem," Ajay Dubey, one of the petitioners and a wildlife conservationist, told the BBC before the court dismissed the appeal. India is home to 60% of the world's tigers. In 2014, a national census showed that the tiger population had risen from 1,706 in 2011 to 2,226, resulting in a 30% increase. This was attributed to activists, government initiatives to streamline conservation and awareness drives in villages.